C. A. Schnack’s Jewelry Store which began business in 1865 moved into this beautiful example of Art Nouveau / Art Deco Architecture where it would remain for the next 66 years. 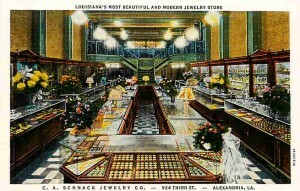 After the empty building was purchased by attorney Mike Small and developer Buddy Tudor, grandson of the structure’s original builder, a decision was made to return this building to service in the form of a mid to high-end casual dining establishment which could be enjoyed by both the community as well as visitors to Central Louisiana. After extensive renovation the Diamond Grill was the recipient of the 2006 Louisiana Preservation Honor Award. On January 1, 2011, Mr. Michael L. Jenkins purchased the Jewel of Downtown Alexandria, The Diamond Grill Restaurant, one of the most beautiful restaurants in Louisiana with fabulous dining. With its romantic ambiance, the Diamond Grill offers intimate fine dining as well as two separate banquet areas upstairs that will seat 120 people comfortably. As a business leader, Jenkins has made great strides and has tremendous invested interests in the revitalization of the downtown area. Besides the restaurant, he has purchased several properties bringing new life to buildings that were once vacant and stagnant in downtown Alexandria.